What is an "analog habitat?" For NASA, analogs are experiments and processes that are developed and tested on the ground in the confines of special laboratories on Earth. Because of the danger, distance, and expense of space flight, it makes good sense to test out conditions that space travelers will face — before they ever launch. Analog missions happen in analog habitats located around the world. Whether in Antarctica, underwater, or in test chambers intended to simulate a Mars mission, these habitats help NASA hone their homes away from home. 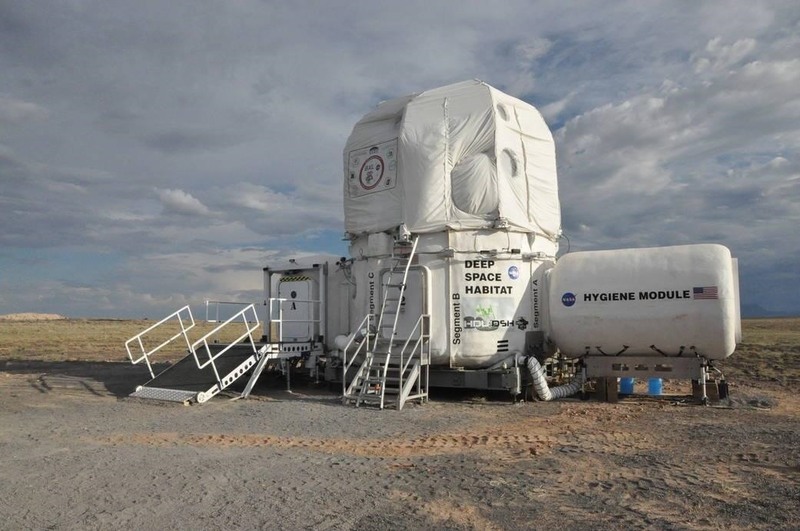 Recently a study published in the journal Microbiome described an experiment conducted in the inflatable lunar/Mars analog habitat (ILMAH), pictured above. The habitat is a closed system that mimics conditions on the International Space Station, which will be similar to living conditions faced by future astronauts wherever in the universe they go. The inflatable habitat was originally designed to evaluate the overall impact of isolation on humans, including how people psychologically and physically react to the extreme isolation of being in space. By using the closed environment of the habitat, scientists were able to observe and evaluate the presence and progression of fungal inhabitants over a 30-day period when humans were present. Put another way, looking specifically at fungi; the researchers wanted to understand how a fungal mycobiome develops in a closed human environment. A "mycobiome," refers to fungal inhabitants, as opposed to a "microbiome," which is a community of bacteria, fungi, and other microbes. In addition to the closed environments in which future astronauts will travel and live, understanding the cycle of pathogen growth is necessary for more earthly concerns like maintaining safe hospital, laboratory, and clean room environments. Fungi are extremophiles that can survive harsh conditions such as low nutrient, desiccation, high/low temperatures, acidic/alkaline, radiation, and other environments. Fungal species not only have been isolated from all known environments on Earth, including barren lands like deserts, caves, or nuclear accident sites but also are known to be difficult to eradicate from other types of environments including indoor and closed spaces. The lunar analog habitat the researchers studied is located in Grand Forks, North Dakota. It has sleeping quarters, a toilet, kitchen, and lab area. It has an independent ventilation system, including a HEPA filter panel. The pod is 12 meters x 10 meters by 2.5 meters in size. The humidity within the pod is between 33 to 55 percent. Inhabited by three people for thirty days, the habitat was cleaned beforehand with 10% bleach and wiped down weekly with antibacterial wipes. Surface swabs were collected four times during the study from eight locations within the habitat. During the 30 day time period, nothing went in, or out, (including supplies, food or water) of the habitat except filtered air. The largest group of fungi present were Ascomycota, which accounted for about 90% of the fungi present. The phylum Basidiomycota came in second. These are common fungi, for example, yeasts, with a known group of about 64,000 species on Earth. These fungi produce spores inside of cells or sacs which they use to reproduce. Where do fungi come from? In addition to the environment, fungi that inhabit the human skin, lungs, and other body parts were part of the habitat mycobiome. Fungal species commonly associated with closed habitats, and found in this pod included Epiccocum, Alternaria, and Pleosporales. Humidity correlated with the presence of fungi in the habitat. More water equals more mold species. Some of these molds are associated with asthma and allergies. High levels of these allergens can produce toxins, colonize the human body, and cause allergic symptoms and reactions. The authors note that the species Alternaria and Epicoccum, if allowed to grow over time, could lead astronauts or space travelers to develop allergic reactions or troubling airway symptoms. Overall, the number of fungi within each genus grew, but the diversity of the species declined over time. The study authors report: "During human presence, the overall fungal diversity has changed, that in the long run, may lead to a conclusion that proper maintenance protocols of a closed habitat may be required to preserve it from deteriorating and keep it safe for its inhabitants." As private and federal agencies design and plan missions to hoist spacecraft and humans into space, good advance knowledge of the pathogens potentially on board is needed. In a press release, senior research scientist Kasthuri Venkateswaran said: "Characterizing and understanding possible changes to, and survival of, fungal species in environments like the ILMAH is of high importance since fungi are not only potentially hazardous to the inhabitants but could also deteriorate the habitats themselves."